We all remember this, right? The ONLY highlight from the 2008 season. I mean really Wisconsin? We only won 3 games that year...and YOU one of them. Really? ESPN's Adam Rittenberg likes Wisconsin. Wisconsin 37, Michigan 28: The Badgers' offense isn't quite as dominant as it was last week, while Denard Robinson and the Michigan attack play a cleaner game against a Wisconsin defense that will allow some points. This is a close game for three quarters before Wisconsin pulls away in the fourth behind its offensive line and running backs Montee Ball and James White. Adam's prediction have been pretty spot on all year. I can't argue with this one. Maize n' Brew does a little Q&A with the only Wisconsin blog I know of, Bucky's 5th Quarter...which is named after the tradition of having all of the fans delay their alcohol consumption by sticking around the stadium after the game to watch the band play. Don't get me wrong, I'm all for supporting the band, but when a game ends, it's time to hit the tailgate. But that's just my $0.02. Oddly, The Wolverine Blog does a Q&A with B5Q as well. Ahh, the perks of being the only blog for your team. MVictors hears that the permanent lights could be up and running for the Wisconsin game. Visual proof here. We had been told that the lights would go up right after the game to be ready for the Big Chill on December 11th. Being a noon kickoff tomorrow though, I don't think the lights will be necessary for this game. mgoblog's Mathlete dives head-first into how much homefield advantage is really worth. Please please please stop talking about how they hung 83 points up Indiana last week. They weren't just on a roll. Bret Bielema is a jackass who desperately wants everyone to love him. That's why his backup QBs were throwing downfield passes in the 2nd half. He ran up the score on purpose. You don't just get on a roll and accidentally score 83 points...this isn't Madden. They will NOT score 83 points on us. I promise. They might score 82, but will NOT score 83. But seriously, I'm not going to sugar-coat it, we're in trouble with Wisconsin's rushing game. These guys boast maybe the best offensive line-running back combination in the country. Even if RB John Clay doesn't play, which it looks like he might not, they don't fall off substantially after him. Montee Ball and James White are very good backs who run the ball well and very physically. Passing the ball isn't their strong suit. They only average about 200 yards per game, but their efficiency rating is 7th in the country. See what a strong ground game can do for a mediocre passing game? Scott Tolzien is not a great QB, but he's good enough. Probably one of the most overlooked QBs in the conference right up there with Kirk Cousins. Wisconsin is going to pound the football between the tackles. And then when they're done doing that, they'll probably switch things up by running the football between the tackles. Over the last 6 quarters, Michigan's defense has shown flashes of brilliance, which is actually giving me some hope for this game. Last week, we didn't give up an offensive touchdown. Of course Purdue is not Wisconsin, so we'll see how that plays out. I think moving Roh back to a down lineman has been a huge lift for this defense. Getting him back on the line, moving Ezeh out to outside linebacker, moving Cam Gordon to spur, Courtney Avery at CB in place of JT Floyd, and of course the play of Kenny Demens at MLB has had a noticeable impact on this defense. No question, we'll test that impact this week. If there's a bright spot for us against Wisconsin's defense, its that they're not great against mobile quarterbacks. They're not bad, but not great. I think the bigger issue when Michigan has the ball is not the Wisconsin defense, but making stupid mistakes that kill drives, or end them with a forced turnover. We can not win this game with 5 turnovers like we did the last 2 weeks. No way, no how. Wisconsin is too good for that. We are going to have to play much more disciplined football. It's an overused cliche, but we need to live to fight another down. We're going to have to control the line of scrimmage and produce some sort of ground game. Mike Shaw is listed probable this week, but Vincent Smith, Stephen Hopkins, Fitzgerald Toussaint and of course Denard Robinson are all good to go. Well, the smart money is picking Wisconsin in this one. And it's really hard for me to argue that. On paper, they're the runaway favorite. 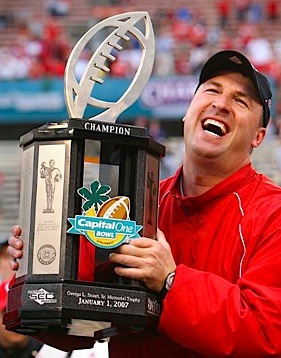 But let's not forget that Wisconsin has not exactly done well in Ann Arbor recently. 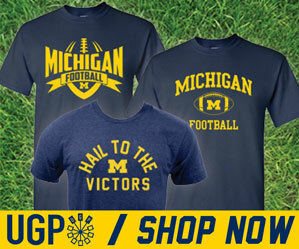 Actually, its been since 1994 that they've actually beat us in the Big House. Bret Bielema is 0-2 against us on the road. Wisconsin fans feel there's something about playing in Ann Arbor that scares them. There's something to be said for that. And there's also something to said for the fact that we're playing our last home game, and this is senior day. I don't think anyone on this team is looking past Wisconsin to tOSU. This game is huge for us. As usual, I'm not going to make a score prediction, but I will say this. If we can stop giving the ball away and stop making stupid penalties, we're going to be right there with Wisconsin all day. They're going to have a couple big plays, likely on the ground. But we're going to have a few big plays ourselves. Odds makers have us a 5 point dog in a game which they expect to see a lot of scoring. The weather report says mid-40s and partly cloudy, so weather should not be a problem. This could shape up to be a very entertaining game which could very easily turn out to be a very good day for this Michigan offense. We'll be at the game and updating our Facebook and Twitter pages from our lofty perch in the pressbox. So check us out and stay connected before and throughout the game for insightful and valuable updates. If you're going to the game, get up and get loud! We're going to need all of the fan support we can get in this one.